Deadlines! How can just one word provoke such vastly different reactions: a prompt response from some people, resistance and rebellion in others, and in others still, a cycle of procrastination and denial followed by a panicked frenzy to completion? As an art director/designer, I am intimately involved with deadlines on a weekly, if not daily, basis. Coping with them is something that I'm grateful and proud to have mastered in my career, because in my early days as a designer, I would often freeze up with the approach of a tight deadline and the work would show this fact. Fortunately, my responses have changed. I just breathe deep, dive in, and give the project everything I've got in the time that I have. IMAGE: Exterior view of one of La Sagrada Familia’s three facades, the Passion facade. I began thinking about deadlines from a different perspective recently while on a fortunate and magical visit to Barcelona, Spain, a place where Antoni Gaudi's architectural work can be found all over the city. If you're familiar with Gaudi, you know that he can really reshape the way you think about architecture. If you've never heard of him, you're in for a treat! Gaudi changed the face of architecture in a time where conservative, gothic styles were much more readily accepted. Holding firmly to his unique vision, Gaudi challenged a whole culture’s aesthetic, and, because of this, his work will be venerated in history books for many generations to come. IMAGE: Detail of La Sagrada Familia’s Nativity facade. Note the use of typography. Gaudi's work is full of fantastic organic shapes, more curves than lines, and symbolism reflecting his very strong religious faith everywhere you turn. He was so devoted to his art that he is said to have resented the need to seek out paying work that took him away from his beloved masterpiece, the cathedral called La Sagrada Familia. Even though the cathedral was his first major construction project, Gaudi’s lofty ambition is already clearly visible in the complex geometry of La Sagrada Familia’s branched pillars and hyperbolic paraboloid surfaces as well as an artistry well beyond the average imagination. From its sculpture, stained glass, and mosaics, to its bell towers with dizzying heights, the cathedral’s beauty is far more than one can possibly fathom in one visit. IMAGE: Interior view of La Sagrada Familia combining Gothic and Art Nouveau forms. "What does this have to with deadlines?," you may ask. Gaudi's work on this cathedral began over 100 years ago. Yet it's still under construction. With a projected (albeit often scoffed at) deadline of 2026—100 years following Gaudi's death—cranes, construction crews, and scaffolding still chase an ever-elusive completion point. According to Wikipedia: "On the subject of the extremely long construction period, Gaudí is said to have remarked: 'My client is not in a hurry.' " Gaudi was so devoted to his beloved project that he was living in the cathedral at the time of his death: he was tragically run over by a tram while crossing the street one day outside his cathedral home. And even then, although he had been involved in its construction for over 40 years, the cathedral was only about a quarter of the way complete. Today, even as it is still surrounded by the sights and sounds of construction, La Sagrada Familia is a sight to behold. Its magnificence leaves one awestruck when standing outside, inside, or even when viewing it from afar. It is truly unique in its interpretation of religious architecture. 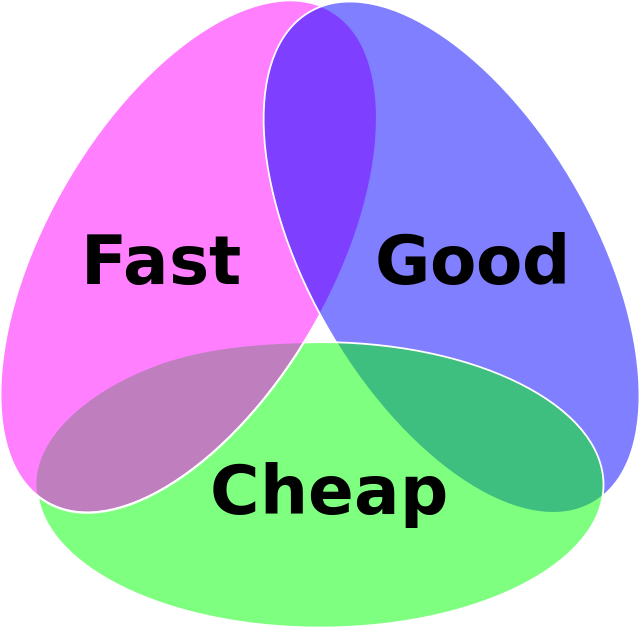 There's a saying in the design world that you can only have two of the following three outcomes when assigning a project: fast, cheap and good. I doubt that Gaudi knew about this triangle. What started out as a project reliant on individual donation has become much bigger than that. Today the cathedral is supported by tourism, and even the Vatican has gotten involved in its funding. The project inspires support even though it meets only one, and the most important, of the above criteria: it is spectacularly and breath-takingly good. While I don't ever anticipate a deadline that will take years to complete, as a perfectionist, I endeavor to meet the needs of any project that comes my way, even if the needs are good, fast, and cheap. It's not always realistic to meet all points of the triangle, though. Sometimes there's just not enough time, and a rush charge is necessary. Or my least favorite outcome: a project is not as good as it could be. I will often turn a project down if I see that outcome as a possibility. There's another saying in the design/art world that you're reputation is only as good as your last project. As for the last item, cheap: isn't that what everyone wants? But let's face it: we've all got to pay the bills. What I can promise is that I always approach a project with the very best of intentions. My goal is to make not just a positive impact on clients' businesses, and their customers, but to also serve the community for a long time to come... even if Studio Haus doesn’t quite have a cathedral’s lifespan! Whether your project is an event to be promoted with no flexibility in the deadline, an ad with a deadline that crept up faster than anticipated, or a deadline that has so much flexibility that the details and needs of the project evolve over time, I'm ready to get started designing. Unlike Gaudi, I will make sure a deadline is determined and met. Good design on time and at a fair price is what I truly love to do!